Credit to image used in pin goes to Gunnar Grimnes. – Changes were made to the original image. You use it for your car, rusty metal pieces, and anything that makes irritating squeaky noises. But have you ever wondered what else WD-40 could do? It’s not just a lubricant; the fluid is versatile and can be used in all sorts of projects you might not have thought about. So here are some clever WD-40 tips and tricks that’ll definitely save you a ton of time and effort. They’re all simple and easy to try and really helpful. So check them out down below and let me know what you think! If you’re kids turn your wall into an art canvas, simply use WD-40 to easily remove your kid’s crayon drawings from any surface. Just spray the fluid directly onto your wall and wipe away the stain with a clean rag. Whether it’s on your carpet, pants, or shoes, stuck gum is seriously a pain. Thankfully though, you can quickly get rid of it by spraying WD-40 directly onto the gum, allow it to set for a few minutes, and then pull the gum off. Super easy right? In case your finger got swollen and you can’t get a ring off (and you need to! ), all it takes is WD-40 and leave all the work to this fluid. Just spray WD-40 around the stuck ring and it’ll quickly slide off. We all have that favorite jacket we use almost all the time. And if you start to notice that the zipper won’t zip up, it can be frustrating. Luckily though, with just a spray of WD-40, you can easily pull the zipper up and down again. WD-40 is an awesome stain remover, especially on your carpet. Don’t let any ketchup or ink stains ruin your carpet. Simply spray the stain with WD-40, let it sit for few minutes, and the stain will be easy to remove. To easily wipe away coffee and tea stains from your countertops, try using WD-40 on a sponge or damp cloth and wipe the stain away. This fluid has an essential ingredient that will make your counters sparkling clean in no time. There’s no need to buy those expensive and toxic toilet cleaners, when you have WD-40. With its solvent compound, any gunk or lime stains on your toilet bowl will be gone in few minutes. All you have to do is spray the fluid into the bowl for a couple of seconds and scrub the toilet with a brush. Before you know it, it’ll be clean and white again! Sometimes, when you think you know a ton about cleaning hacks, something pops up that makes your life that much easier. 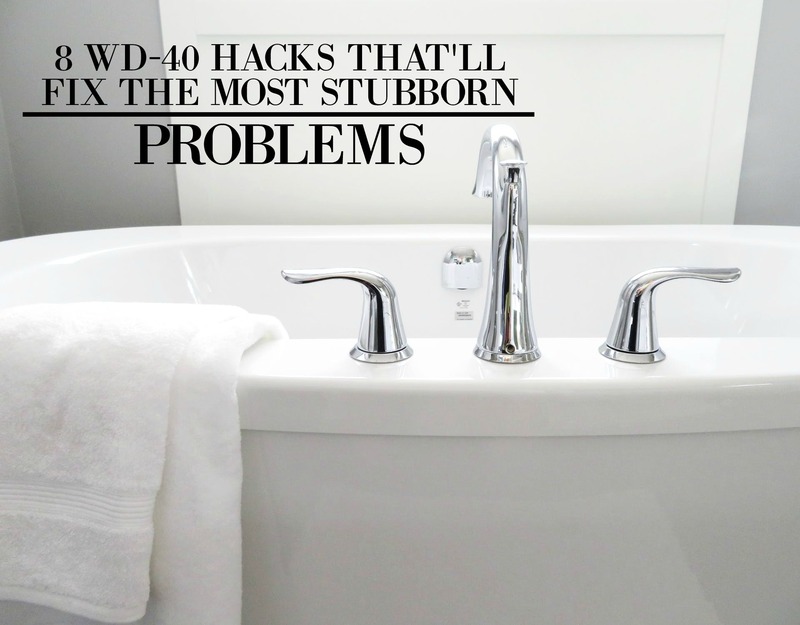 And with these eight WD-40 hacks, all those stubborn problems and stains will gone in no time. So give these tips a try and let me know what you think! Now, if you have any other WD-40 hacks that can be added to the list, comment down below. I’d love to hear from you! I use it to clean all the funk off my oven windows I spray it on wait 10 minutes and scrub it off with silver scrub pad. Doesn’t scratch the glass and looks like new.